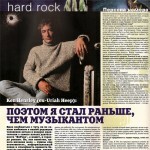 Another excerpt from an interview with Ken Hensley published in the “InRock” magazine (№ 8, 2002, category “The Person”). InRock: It is such a mystery to me, why you sang on the record of “Look At Yourself” album, and why on the concerts lead singers did that? Ken Hensley: Well, because it was awkward for David not to sing lead vocals, I mean David was the vocalist, it just happened on that day in the studio my voice was in better condition that David’s, so I sang lead vocal on “Look At Yourself”. Generally speaking, in live situation David sang everything. That’s just a difference between studio and live, really. IR: It seems that in the ’70s you’ve penned some lengthy, epic-like tunes. Now your style changed a bit. Why? KH: Well… no particular reason, just simply just what’s I’m doing at the moment. The prelude for “Running Blind” is actually a part of something that was much bigger, when I began to write it, and I wanted to make it a song. But once again I wrote the music first so I couldn’t find any words for it. But I don’t like to just design what I gonna do. I prefer to sit down and write — and let it be what it is… just give something natural organic life. I don’t sit down and think “I’ll write a 20-minute soap opera theme”, or “Oh, it’s Wednesday, time for a concept album”, you know, it’s nothing like that. I’m kind of sit and write whenever ideas come. IR: You once said that you don’t listen to “Return To Fantasy” anymore. So I suppose that there is something wrong about that time. Can you tell us why? KH: No, I didn’t mean to imply that at all. There are some albums within my collection I don’t go out of my way to listen to. Whereas I will listen to “Demons and Wizards”, and I will listen to the double live album, because they are albums I particularly enjoy, but I don’t… you know, “Conquest” I don’t care to listen to too much… “High & Mighty” I enjoy listening to, usually if I am driving or flying, or something like that. I don’t mean to say it’s something wrong with it — it’s just not something I’ve got “Oh, I must listen to “Return To Fantasy”… it’s not a highlight of my day. IR: And what the time it was for you — 1975 and about that? KH: It was OK, it was alright… I mean we were having some problems — obviously Gary had some drug problems at the time… We all had problems, you know… all of us had problems with going into that era. And then John came along and kind of help to stabilise things a little bit. It was an OK time. It wasn’t the happiest time in my life, and I don’t think it was the strongest time for the band musically, to be honest. IR: Was it the time when David started drinking heavily? KH: That would be around “Wonderworld”. I remember David (God rest his soul) I remember him walking around… crawling around the floor in the studio trying to find his bottle of Chivas Regal which we hid from him. It’s a very sad situation. It happens too often, I’m afraid. IR: And why do you think it happened? KH: You know, a lot of things happened to all of us at the time when we were so successful. It was an insane time, really. So crazy. It’s hard to manage that kind of thing. Dealing with success, and selling out gold and platinum records every day… surrounded by people that say everything you want to hear but not probably what you need to hear… It’s a difficult time to manage, and that was the demon that got David, unfortunately. IR: And by the way, what kind of person was he to you? KH: A good guy. A great guy. I loved working with him because he was a pioneer. He was definitely a frontman, and he established a new direction for singers. I didn’t socialise with David very much, but we really worked very well together as a team. IR: What kind of guy was Mick Box in the early ’70s when you first met? KH: The same guy he is now, just a happy guy and a very dedicated guy. I saw Mick last Saturday and he seems like the same person like he was then. IR: And do other guys change — I mean Trevor and Lee? KH: Pretty much the same. But I don’t see them very often, so I don’t know. You know, I only see them in a musical situation, so it’s hard to tell.